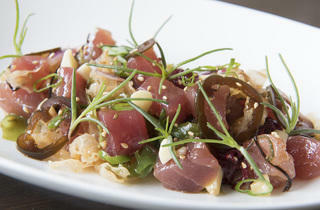 Picture a Hawaiian restaurant. Noreetuh is not that place. 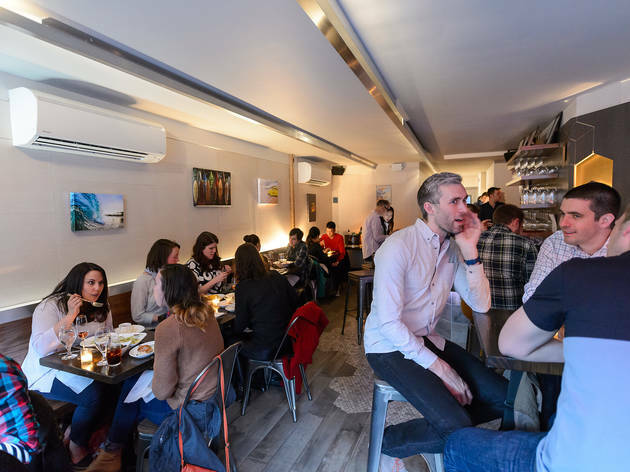 There’s no tiki-torched, lei’d-back Pacific camp on display at this dark-wood East Village bistro, looking more like a sleek, softly lit wine bar than a restaurant cracking open tins of Spam on the daily. 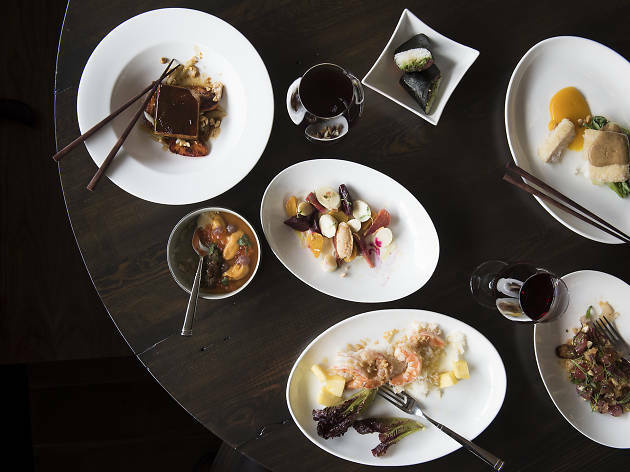 That’s not a shock, given the pedigree behind the place: Jin Anh, Gerald San Jose and Honolulu-raised chef Chung Chow all have fine-dining tenures at Per Se under their belt. But white-tablecloth eating this isn’t. 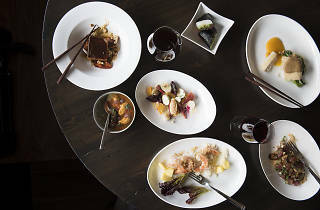 It’s sophisticated, no doubt—a smartly curated and generously priced wine list by Anh takes the place of any coconut-hulled cocktails—but Chow embraces the Hawaiian lowbrow as readily as he does the high. 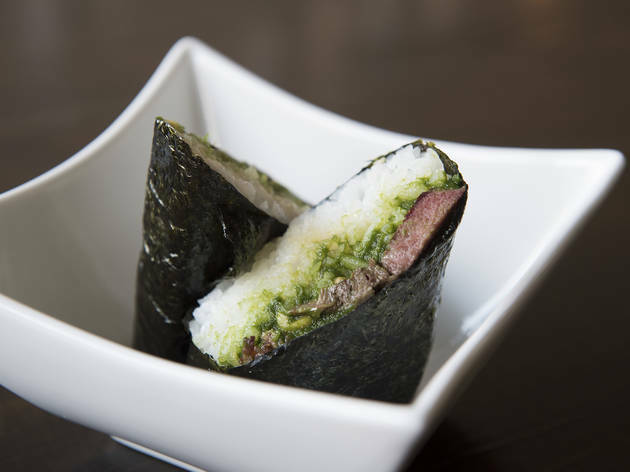 Musubi, that junky gas-station novelty comprising grilled Spam slapped atop a tile of rice and wrapped in seaweed, gets upgraded via lean corned-beef tongue nestled on cilantro-sauced grains with crunchy peanuts ($6). The canned ham arrives camouflaged inside tender tortellini instead, its porky funk nondescript, bridled by bittersweet goji berries, wilted yu choy and runny poached egg ($17). 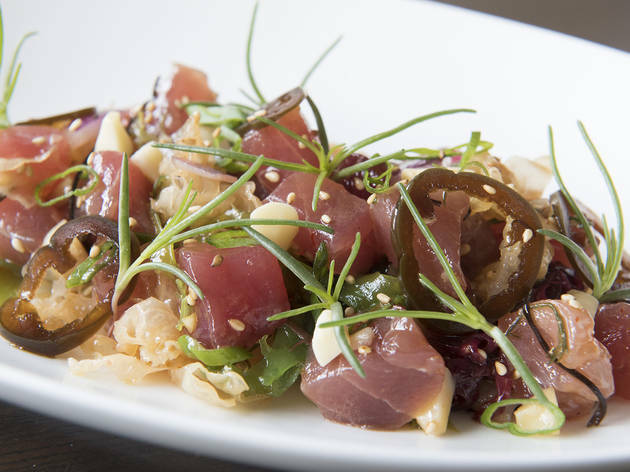 More successful in its aim to refine is Chow’s poke salad ($17), quivering cubes of sesame-oil–slick big-eye tuna texture-bombed with chunky macadamia nuts, pickled jalapeños and delicately briny seaweed tendrils. 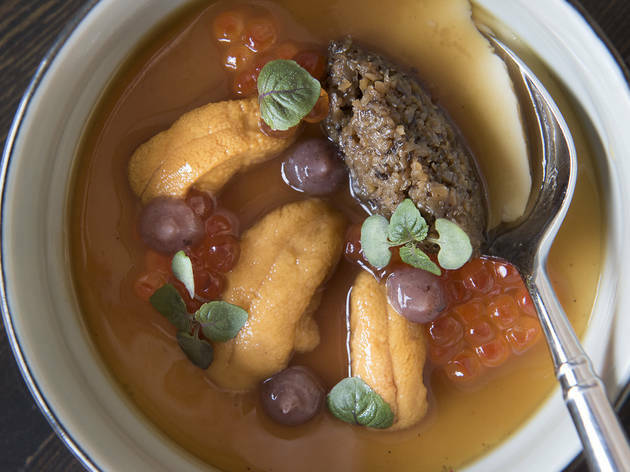 A chilled bowl of silken tofu ($12) is a culture-crossing beaut, nodding to the still-prevalent Asian migrations to the islands, soft as chawanmushi with equally Japanese touches like poppy ikura, shiitake mushrooms, anisey shiso and velvety slips of uni. 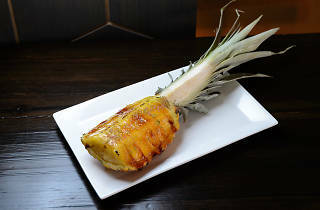 Not everything works—croquettes filled with kalua pork (swine traditionally cooked in an underground oven, a favorite of luaus) are worthy of space on an Applebee’s menu—but Chow does ample work giving the underserved cuisine its proper due. 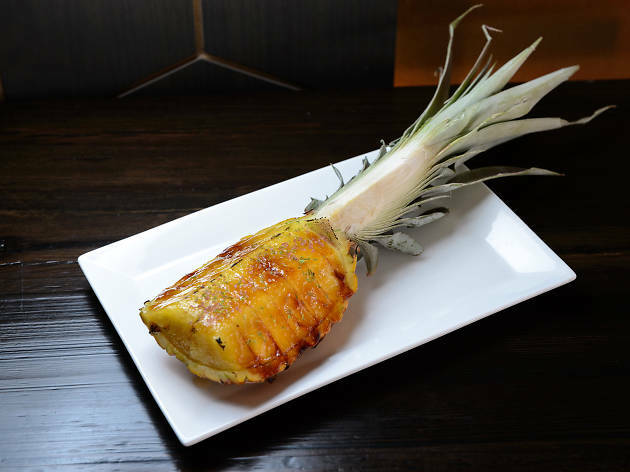 Average entrée: $18. AmEx, Disc, MC, V.
I think I'm comparing this to the actual Hawaiian food I had in Hawaii and that's why I'm giving it 3 stars, but objectively this is a really great spot. 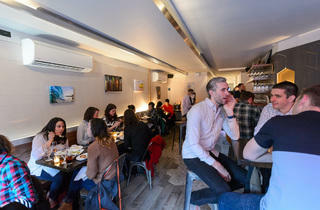 It's a super cute small restaurant in the East Village with maybe 15 seats. I think in the summer/spring there might be outdoor seating but I went on a day when the temperature was about 18 degrees. I got the salmon poke, and I wish there were more sauces in the poke but overall it was quite tasty. I might go back and try something else, but could also go without coming back for more. 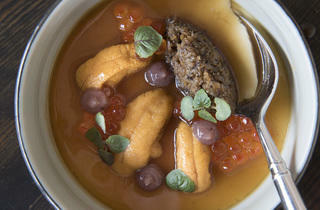 I went to noreetuh for Restaurant Week and had an absolutely fantastic meal. 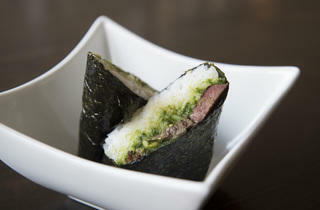 In addition to the $48pp tasting menu we ordered the Corned Beef Tongue Musubi (2pcs) for $6 and a $30 bottle of sake. All said and done, the meal for 2 cost $120 - and it was worth it. 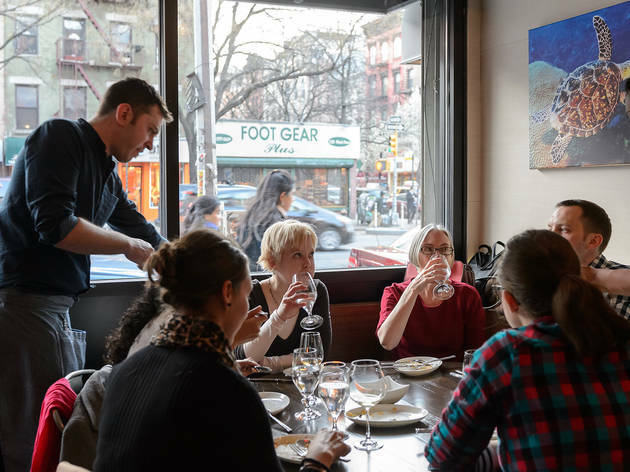 We got to try a LOT of the menu because our preferred dining style is to each order different dishes and share, and they didn't get stingy with the portions as a lot of restaurants tend to do for their restaurant week menus. We left very comfortably stuffed. The Big Eye Tuna Poke had enormous chunks of tuna, the Corned Beef Musubi was moist and flavorful, the Silken Tofu with Uni and a bunch of other deliciousness was INSANE (I can't say that enough - I didn't want this dish to end), Mentaiko Spaghetti was delicious (but a little light on the fish), Pineapple Braised Pork Belly was every bit as delicious as it sounds (executed perfectly, but nothing mind-blowing). As for the desserts: the Chocolate Haupia Sundae tasted like a fudgy coconut s'mores sundae (really delightful) but the real stand-out dessert was Coconut Tapioca dessert with azuki bean, burnt orange ice cream and fresh chunks of mochi...it's like all of my favorite things in ONE dish. 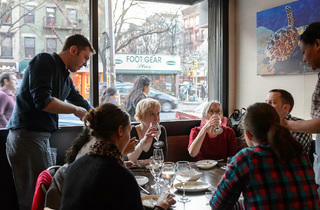 We had a fantastic time, and look forward to going back for a non-Restaurant-Week meal sometime. I was very excited to try Noreetuh when it opened, but it didn't live up to my expectations. The food was overpriced for what it was, and didn't taste nearly as interesting as I'd expected. I would probably not go back.